I finally got to cook something new that's worth writing about. I have two twelve-year-olds staying with me for the Easter holidays, my nice N. and her friend L. We've been out and about a lot over the last week (Wales, Chester Zoo, Tatton Park and London) and today we decided that we needed a little rest day, just playing games and going for a little walk in the sunshine. That means I get some time to blog. After making Easter nests and an egg colouring session yesterday afternoon, I decided to make tacos and Mexican rice for dinner for which my friends E. and JM. joined us. 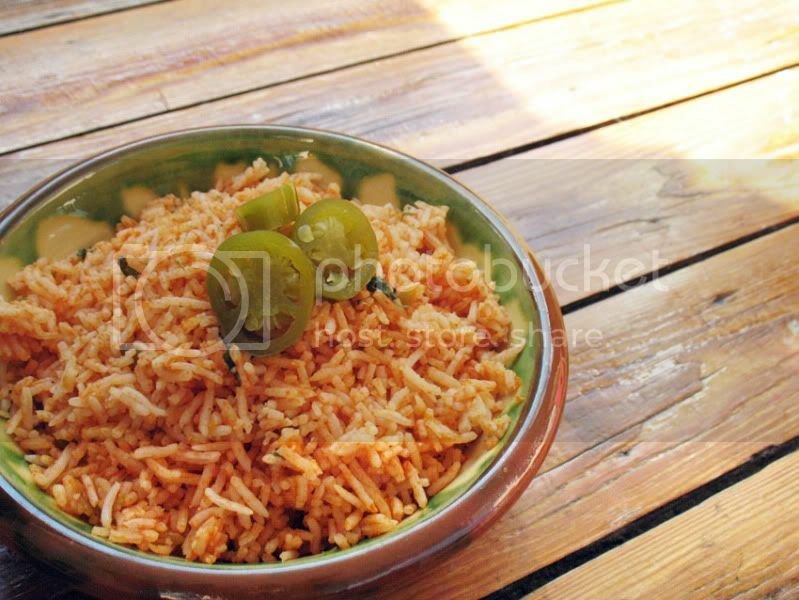 I had never really tried making my own Mexican rice, but have always liked it in restaurants. Looking at the recipe, it seemed a bit long, but it was actually quite easy and since it is mainly cooked in the oven, once it was all put together it was very little work. Preheat your oven to 170C/350F. Process tomato and onion in processor or blender until pureed and thoroughly smooth. This should make two cups. De-seed and finely chop the jalapeno peppers. If you're using canned/pickled jalapenos, just chope them. 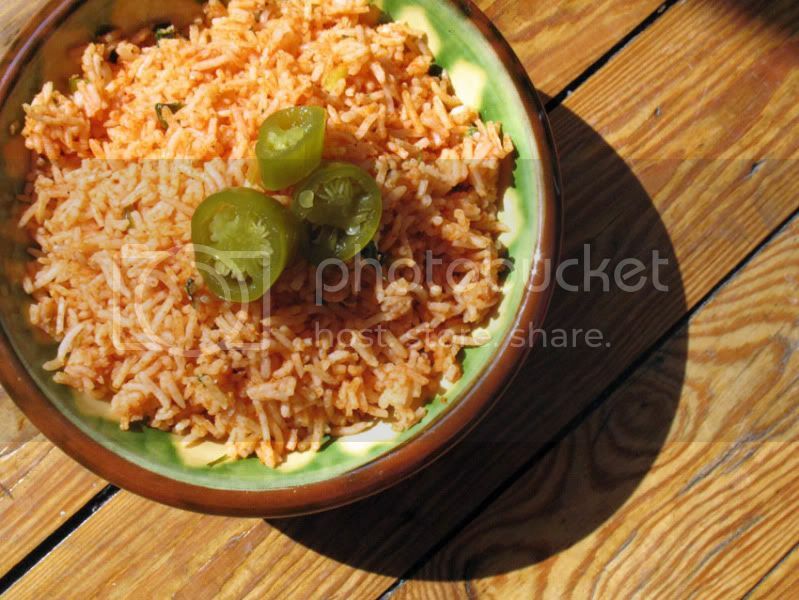 Put your rice in a fine sieve or colander and rinse thoroughly for about 2 minutes. The water should run clear after that time which means that the excess starch is removed. Cover the sieve/colander and shake well to remove any rest starch still in the rice. This is really important so that the rice is fluffy in the end and not sticky. Heat some oil in heavy bottomed ovenproof pan with tight fitting lid over medium high heat about 2 minutes. The oil should sizzle when you drop in a few rice grains. Add the rice and stir fry until the rice is light golden and translucent. This takes about 6-8 minutes. Reduce heat and add garlic together with 2/3 of the chopped jalapenos and cook, stirring constantly for about 1 1/2 minutes. Add the chicken stock, the pureed tomato/onion mixture and salt. Increase heat to and bring to a boil. Add the rest of the jalapeno, the chopped fresh coriander and the lime juice. I'll remember this next time I do Mexican, it sounds really tasty. I love the photo at the bottom, it looks very summery! Sam, thanks. The sun came streaming through my large living room window, so I made the most of it. Val, it certainly has been. I'm definitely not used to having two kids around. They keep me on my toes! It's been a lot of fun though. Don't know how I missed this - looks lovely! !